It's a Berry Fun Thing To Do in June! June is strawberry season in New England, and nothing quite says summer's here like strawberry shortcake piled high with whipped cream and featuring ripe, juicy strawberries you plucked yourself at one of the region's pick-your-own farms. Don't forget your friends, co-workers, family and neighbors when you pick delicious strawberries—why not take a few extra pints home as a tasty souvenir of your New England getaway this month? This state-by-state guide will help you find pick-your-own strawberry fields in New England. Keep in mind that it's always a good idea to call ahead to check current picking conditions. Located off Interstate 95 at exit 57 just 90 miles from New York City, Bishop's Orchards has been growing strawberries since the 1940s. The pick-your-own strawberry season typically runs from mid-June to early July. If you're looking for a strawberry picking outing, Lyman Orchards is your ideal spot for a day trip. They offer nearly a dozen varieties of strawberries for the picking and so much more! Buy specialty products at the Farm Market and even play 45 holes of golf on Lyman's three courses. The Pickin' Patch is an enduring Connecticut place for pick-your-own fruits and vegetables, especially strawberries. Even Martha Stewart has visited the farm for plump, delicious strawberries. The Rose Family has been farming since 1910. Pick strawberries at this historic farm and enjoy a hearty, farm-fresh Sunday breakfast with a view here during the picking season. Connecticut's Department of Agriculture has compiled this list of pick-your-own farms in Hartford County, including several that offer strawberries. Connecticut's Department of Agriculture has compiled this list of pick-your-own farms in New Haven County, including several that offer strawberries. Visit this Aroostook County pick-your-own farm, and pick your own strawberries in northern Maine. Keep in mind that the berries ripen later the farther north you go in New England. From the Maine Department of Agriculture, here's a searchable guide to places to pick your own strawberries in Maine. Pick your own strawberries in June, and be sure to bring the kids on weekends! Lookout Farm offers train rides, face painting, farm animals, a hay pyramid and more children's entertainment. There is an admission fee. Adults should be sure to stop into the Lookout Taproom to sample beer made with the farm's own strawberries. Located a short ride north of Boston, this farm offers pick-your-own strawberries beginning in June. Keith's Farm offers strawberry picking daily in season. This pick-your-own strawberry spot opens in early June. Treat yourself to a real strawberry slushie from the Tougas Farm Kitchen when you've finished picking berries. From the Berkshires to New Bedford, here's a round-up of Massachusetts farms that offer strawberry picking, from the Commonwealth of Massachusetts Department of Agricultural Resources. "All we sell is fruit and the experience of picking it," says Butternut Farm owner Giff Burnap. Strawberries kick off the pick-your-own season at this peaceful, Seacoast-region farm, which also has a farmstand selling homemade pies. The strawberry harvest begins in mid-June at this Lake Sunapee-area farm, which is also home to a lovely flower cutting garden. Pick-your-own strawberry fields are located at their acreage on Pleasant Lake. The New Hampshire Department of Agriculture provides this handy guide to PYO farms in the state including many that allow you to harvest your own red, delicious strawberries. Strawberry picking usually starts the first week of June at this Rondout Valley farm. Here's a guide to pick-your-own berry farms located within day trip distance of New York City. 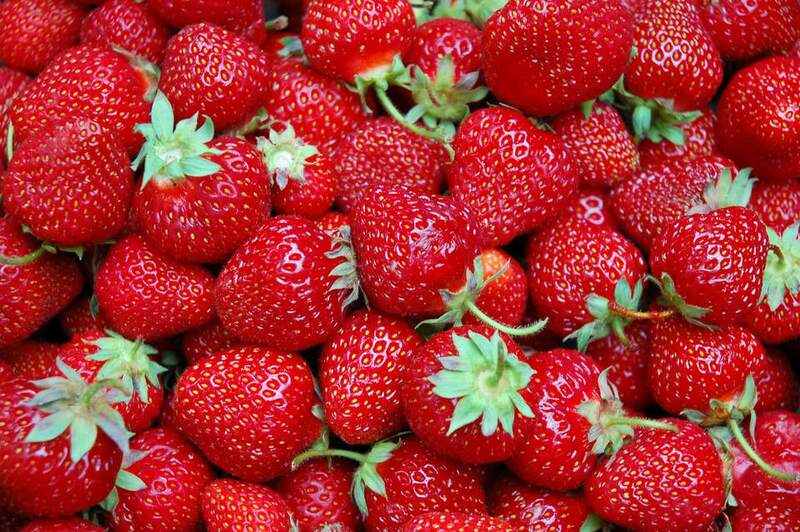 You'll find information on a few farms that offer pick-your-own strawberries in this directory of farms, orchards and vineyards in the Blackstone River Valley of Rhode Island. Strawberry picking is expected to begin the first week of June in 2019 at this sixth generation, family-run farm. Pick your own organic strawberries at this groundbreaking Vermont farm, where there are special rows of berries just for toddlers and their families. Love all sorts of berries? By appointment, you can return to pick red and black currants, raspberries, mulberries or blueberries when they are in-season. Pick strawberries starting around mid-June, then visit the farm market and bakery at this agritourism destination in Vermont. The harvest will be celebrated at the annual Strawberry Festival on Satruday, June 22, 2019. You'll find a number of places to pick strawberries in this county-by-county directory of Vermont pick-your-own farms compiled by PickYourOwn.org. Check Rose's Berry Farm's handy guide to how to pick and care for strawberries, including tips for freezing.